Witness life imitate art at Laguna Beach's 86th annual Pageant of the Masters. Held each summer during the Laguna Beach Festival of the Arts, the nationally-renowned series brings the world's most iconic paintings and sculptures to life through tableaux vivants. Whether you're traveling across the country for the pageant or driving in from LA for a weekend getaway, you'll tove the fanfare, excitement, and living portraits of the Pageant of the Masters! Book your room today and be part of Laguna Beach's most storied art tradition! The Pageant of Arts is a phenomenal spectacle that gets better each and every year. As you start planning your trip to Laguna Beach, take a look at the essential information for the 2019 festival! Embark upon an enlightening journey through time as the 86th annual Pageant of the Masters relives H.G. Wells's The Time Machine. Paying homage to the groundbreaking sci-fi work that inspired everything from Dr. Who to Back to the Future, this year's theme will bring time travel to Laguna Beach. This summer, see "The Time Machine" come to life as the tableaux vivants and their musical accompaniments celebrate the steampunk world of H.G. Wells. Buy your Pageant of the Masters tickets in advance for your summer getaway to Laguna Beach! In addition to securing an awesome sightline for the show, your Pageant of the Masters ticket also grants you entry to the Festival of the Arts for the entire summer! Use your pageant ticket to peruse the festival's most engaging galleries, unwind with a glass of wine, or catch some great local music! Tickets can be purchased online or at the box office and are non-refundable. The 2019 Pageant of the Masters features nightly performances between July, 7th and August 31st at 8:30 p.m. Admission to the outdoor pageant theatre typically begins at 7:30 p.m. and requires the purchase of a ticket. Your Pageant of the Masters ticket also gives you access to all of the amazing art shows, concerts, and galleries at the adjacent Festival of the Arts of Laguna Beach! As you pick the date for your trip to Pageant of the Masters, check out the festival schedule to find the perfect weekend for your Laguna Beach getaway! The Pageant of the Masters is held in a 2,600-seat, outdoor amphitheater, adjacent to the Festival of the Arts of Laguna Beach. 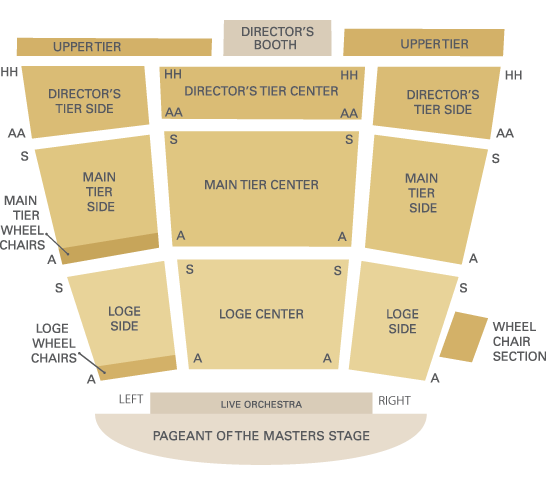 If you want to see the full range of nuance, detail, and finesse of the tableau vivant, we recommend buying seats early and sitting in the Loge Center section. However, you'll still have a great time (and save some money) in the Main Tier or Director's Tier. La Casa del Camino is located just 1.3 miles from the Pageant of the Masters grounds. Whether you plan to drive, rent a bike, or hop on the bus, our oceanfront hotel puts you front and center for Orange County's most icon arts festival! Parking near Pageant of the Masters can be challenging during peak hours. The festival grounds offer limited free parking, but most guests take advantage of metered street parking or paid lots downtown. Parking for the pageant can cost up to $15.00 and parking at La Casa del Camino is always free. Don't feel like driving? Uber fares begin at $5.00 each way, or you can pick up the #1 Bus or the Downtown/Ritz Bus from the end of our block northbound to the Laguna Beach bus station. From there, it's a five-minute walk to the festival grounds. If you're already out and about in Downtown Laguna Beach, the festival is an easy five-minute walk.